This enthusiastic study of the owls of the Pacific Northwest may inspire new fans and citizen scientists. Leigh Calvez had studied orca and humpback whales, spirit bears and brown bears, before owls crossed her line of sight. The Hidden Lives of Owls: The Science and Spirit of Nature’s Most Elusive Birds is the story of the time she spent pursuing the owls of the Pacific Northwest, where she lives. Calvez meets with citizen scientists and professional researchers, and travels through Alaska, Montana, Washington and Oregon in her quest to spot and, more significantly, to understand a range of species. In a wondering tone, she considers the hard science and spiritual connections of Flammulated, Snowy, Great Horned, Great Gray, Burrowing and the controversial Barred Owls–which have thrived in the Pacific Northwest at the expense of other owls. Calvez shares some of the fascinating particulars of owl biology: specialized feathers that support silent flight; asynchronous hatching and fledging schedules; reversed sexual size dimorphism (females are larger than males in most owl species). She investigates the environmental threats to these birds, and she sympathizes with mothers forced to choose between the safety of their babies and their own. 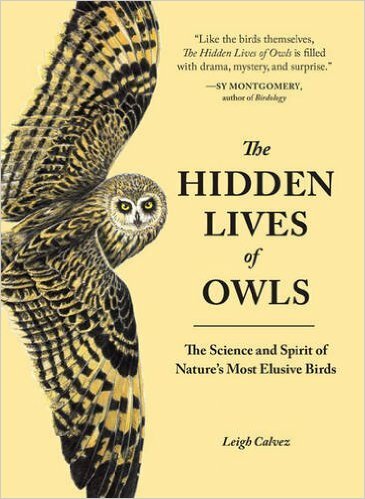 The Hidden Lives of Owls is both informative and often reverential. While Calvez has chosen her subjects by their proximity to her home, many species considered here migrate or travel from coast to coast in the United States, and from Canada to Mexico, giving this book appeal across North America. In the end, Calvez makes a strong argument for the owls’ particular needs and interests. This review originally ran in the August 26, 2016 issue of Shelf Awareness for Readers. To subscribe, click here, and you’ll receive two issues per week of book reviews and other bookish news.